Listen Israel: The most central prayer in Jewish tradition is not a prayer at all. Prayers by definition are directed to God. These words are directed collectively inward. They indicate that we are about to read a statement of faith, of purpose, a sacred mission statement, if you will. 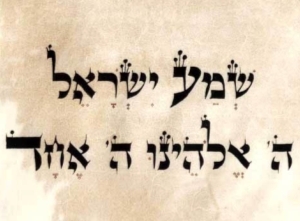 YHVH is our God: “YHVH” is God’s ineffable name, the unpronounceable, unknowable proper name of the God that in ancient times, the Israelite nation claimed as its own. ADONAI is One! : Some choose to translate the word“echad” (“one”) as “alone.” This suggests an imperative: the Israelites must worship YHVH as God and no other. Religious exceptionalism? Some might choose read these words that way. But on a much deeper level, the words “YHVH is One” express a profoundly universal world view. Our sacred mission statement is a reminder that while we live in a universe of diversity and multiplicity, this variety is ultimately part of a much larger sublime Unity that moves through us all. Listen! Amidst the raucous, cacophony that resounds throughout our world, we may yet discern one Voice ever calling to us. This voice goes by many names; we call it YHVH. Let us attune ourselves to it with all our heart, all our soul, and all our might.,. In fact I’ve heard the word “exad” used by Christian missionaries to Jews as a “proof” of the triunity of God.